Swinging from a tree, wind on your face with the sun shining down… there’s nothing more tranquil than hanging from a hammock on a nice day. Sounds heavenly, right? 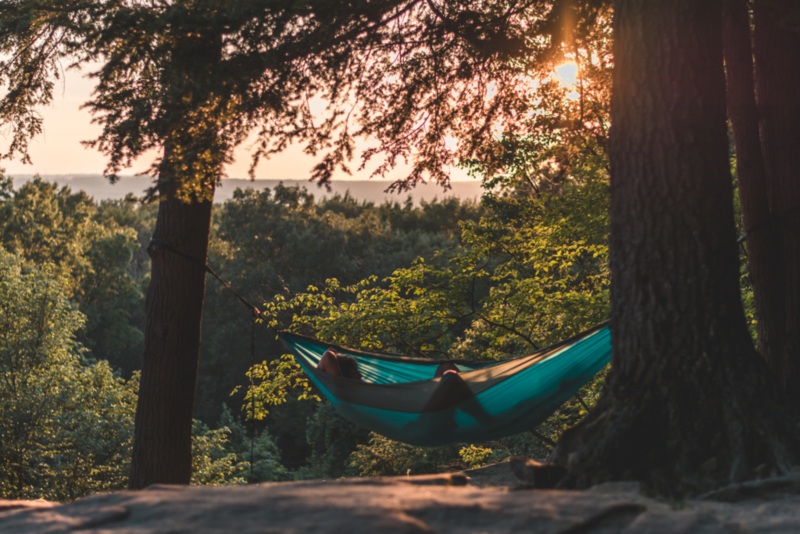 Have you heard of ENO (Eagles Nest Outfitters) hammocks? If you live near a university or a park where teens hang out, you’ve probably seen them. 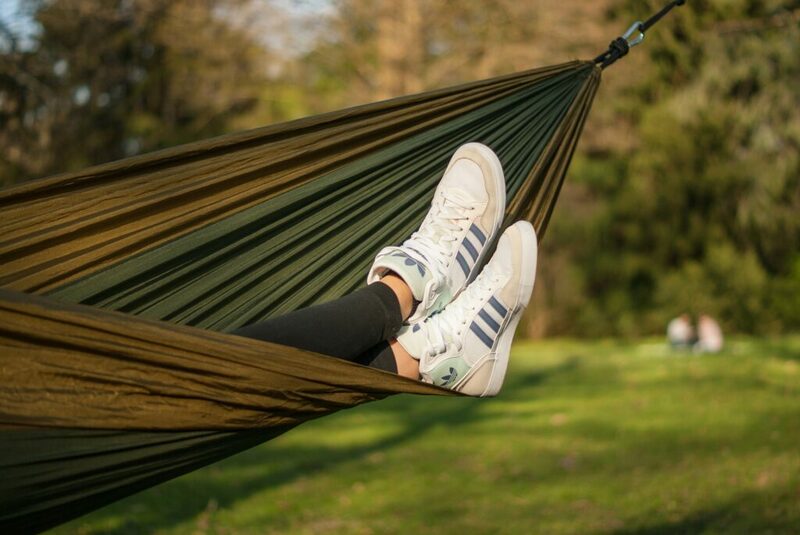 Hanging around parks and campuses in hammocks has become a popular pastime and ENO is the go-to brand for many. A reader, who is the mom of a teen, asked me if there are any cheaper alternatives to ENO hammocks. She told me that they’re quite expensive and seem overpriced when only used for hanging around a park (as opposed to camping or backpacking). 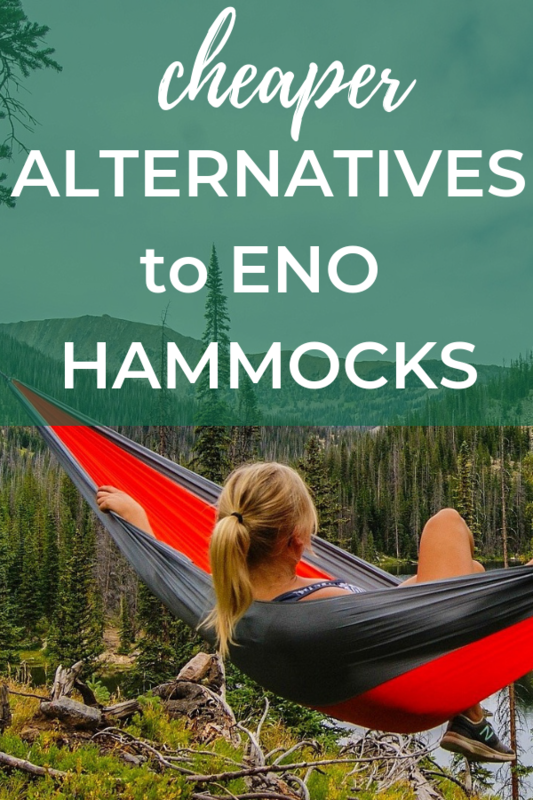 I investigated, and here are results of my search for inexpensive alternatives to ENO hammocks. Hammock Only or Suspension Included? When you buy an ENO hammock, you’re buying the hammock only. No suspension is included. ENO brand suspensions start around $30, making the total cost of an ENO DoubleNest with suspension around $100. Many other brands of hammocks are sold together with a suspension system. Be cautious when you’re shopping and notice whether the hammocks include a suspension system. Also, notice whether it’s a strap suspension system (simple to use) or a rope suspension system (a little trickier). Rope suspensions also need to include tree straps, as bare ropes can damage trees and are banned from most campgrounds. There are a number of cheaper alternatives to ENO DoubleNest Hammocks. Some people might call these ENO dupes or ENO knockoffs, but they are really just other brands of quality hammocks. There are actually so many different brands of hammocks that are only 25-30% of the cost of ENO that it’s a little overwhelming to narrow it down. I’ll try to focus on covering the most frequently mentioned brands. I’ll also stick to Amazon listings that have a high rating on FakeSpot, indicating that their reviews aren’t fake. Always be cautious when relying on reviews, as some companies fill their listings with fake reviews. The Honest Outfitters Double Hammock came up as a good option for a quality hammock at a very reasonable price. This hammock seems to be popular among those searching for a cheaper alternative to ENO. The price for this hammock is so low, I had trouble believing it. The reviews are very positive, though, and get a grade of A from Fakespot, so the reviews are likely trustworthy. If you’re heading out to the park, you may like a cute pair of sunglasses too! Check out my post about cheaper alternatives to ray-ban sunglasses. You may also need a bag to carry all of your supplies in! A utility tote would work great and there are some great cheaper utility totes available. If you enjoyed this post, you might like to read some of my other cheaper alternatives posts for more money-saving ideas! Have you tried any of these hammocks? I’ve love to hear your experiences in the comments below! The price is what drew me, and it had good reviews. I don’t know anything about hammocks. A friend of mine saw a photo I put up on Instagram, and asked me if it was an ENO. Not knowing what that was, I looked it up, and was shocked that it was so expensive and didn’t even come with straps. I don’t know how the Oaskys would hold up for frequent camping, but for casual relaxation in our yard it is fantastic. It did not have instructions so I had to google how to tie it up, but I got the hang of it fairly quickly. I love it. That’s great that a cheaper hammock worked for you! It seems like the ENO hammocks are more than the average backyard user needs.